Now only $1.00 – each! 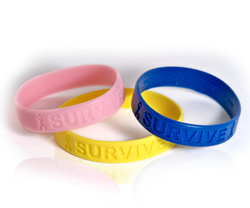 Get your SURVIVE bracelet in blue, pink or yellow! All proceeds support Camp Rainbow Gold, a camp for children who have been, or are being treated for cancer, located near Sun Valley, Idaho.